How financially independent are municipalities? Spending and income play an important role in determining local government’s ability to deliver services. The ability of a municipality to generate its own income is an important sign of its independence. The Quarterly Financial Statistics of Municipalities (QFSM) survey collects data on municipal operating expenditures and incomes on a quarterly basis. 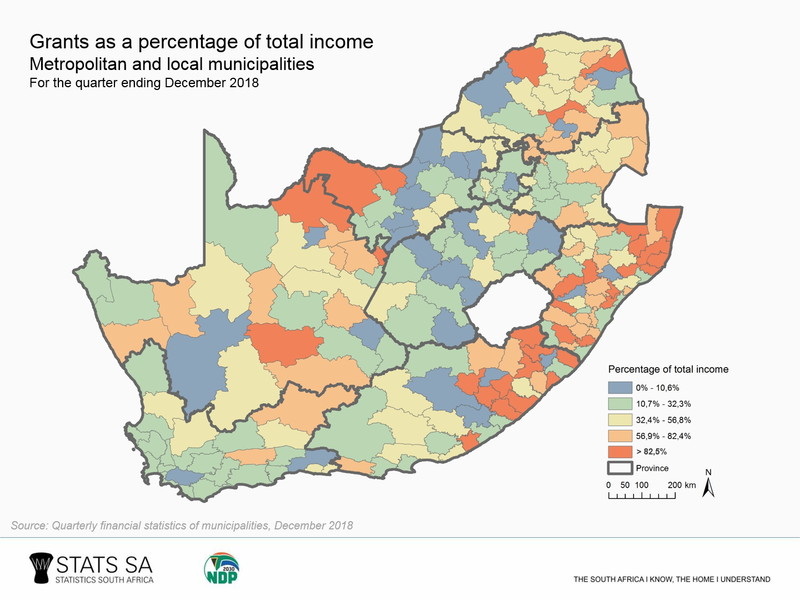 The December 2018 release, for the period 1 October 2018 to 31 December 2018, offers insights into the breakdown of municipal income. Municipalities obtain their income from many different sources. These can be broadly grouped into two main categories, namely income generated by the municipality itself, and fiscal transfers from other spheres of government, often referred to as grants and subsidies. A municipality can generate its own income via property rates, service charges and fines. Property rates are sourced from owners of land, homes, buildings or businesses. The amounts levied by municipalities for property rates are generally based on the value of the property. Municipalities also make use of charges that are levied on services such as water, electricity, sanitation and refuse removal. Municipalities also sometimes charge users for the use of their facilities, such as sports grounds and recreation centres. Fines and penalties are another source of internally-generated income. These include, among others, traffic fines, penalties for contraventions of by-laws, and penalties for overdue payments of services. Together with money generated by the municipality, additional income is sourced from other spheres of government in the form of grants and subsidies as well as donations made by the public to municipalities. Grants are fiscal transfers, often from national government, that usually do not have to be repaid but often come with the condition that they are used for defined or specific purposes. The Municipal Infrastructure Grant (MIG) is an example of a conditional grant that is given to municipalities with the specific condition that those funds are used for maintaining infrastructure, such as roads, pipes, and wastewater treatment plants. Unconditional grants, on the other hand, are allocations that can be used for a variety of purposes. How the unconditional grant is used is left to the discretion of the municipality, according to its own needs. The equitable share is an example of an unconditional grant that a municipality can use for purposes that fall outside the scope of improving basic services, such as spending on administration. 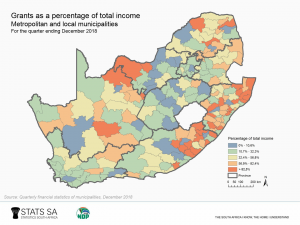 The December 2018 QFSM indicates that municipalities in South Africa generate, in total, 72% of their own income. The remaining incomes are transfers from national and provincial government as well as voluntary donations from public constituencies. There are, however, significant differences between income sources for municipalities. For instance, metropolitan councils generate, on average, 83% of income themselves. District municipalities and local municipalities, in contrast, raise only 18% and 64% of income from their own sources, respectively. The major source of income for all municipalities in the country is service charges (42%), which is a combination of water and electricity sales, sewerage and sanitation and refuse removal charges. Service charges are followed by grants and subsidies (28%), property rates (18%), and other income (12%) which, amongst other things, consist of fines, licences and permits, gains on disposal of property, plant and equipment, public contributions and donations (click on the chart to enlarge). 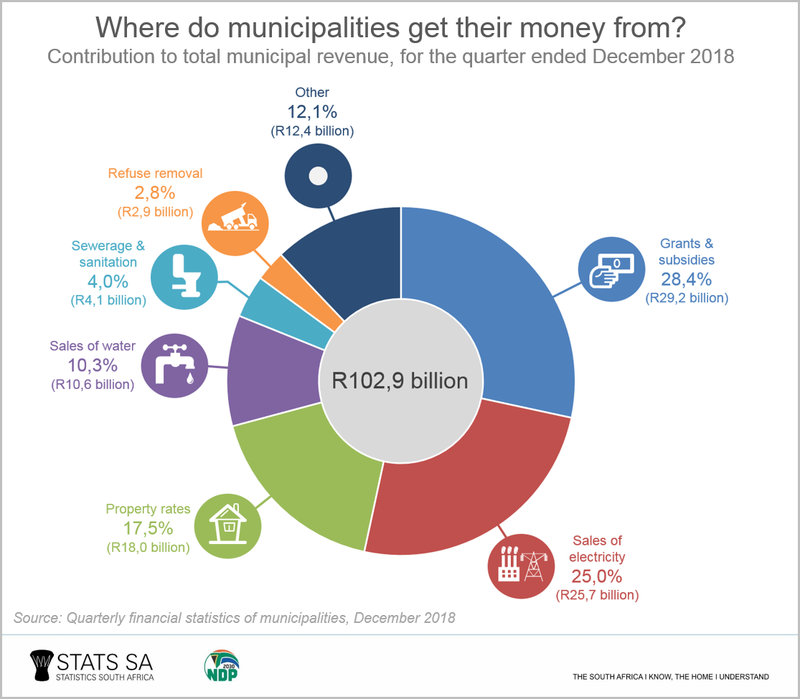 Fines pulled in just over R1 billion for municipalities in the December 2018 quarter, up from the R547 million collected in the previous quarter. As a percentage of total income, fines contribute just over 1%. Licences and other permits, on the other hand, brought in R346 million in income, an increase of 8,5% compared with the September 2018 quarter R319 million. As can be seen from the map, while some municipalities generate a fair amount of their own income, many municipalities – especially those that are predominantly rural – are almost totally dependent on funding transfers from national government. Examples include Engcobo Local Municipality in the Eastern Cape, which sources 95% of its income from grants and subsidies, and Kagisano-Molopo Local Municipality in North West, which depends on grants and subsidies to supplement 86% of its budget. This is despite the fact that municipalities are required by legislation to collect their own income.1 This, however, is not possible in many cases due to various factors, such as the poor income base of that constituency and non-payment of services by residents. Metropolitan municipalities and secondary cities are relatively self-sustainable as they produce much of their own income themselves. The eight metropolitan municipalities, for example, sourced 17% of their income from fiscal transfers in the December 2018 quarter. It is evident that collection of own revenue is a critical determinant of the financial viability of municipalities as fiscal transfers may not be sustainable over time. The amount that municipalities collect from their own sources is an indication of their financial independence. For more information, download the latest Quarterly Financial Statistics of Municipalities (QFSM) here. 1 The White Paper on Local Government, 1998.